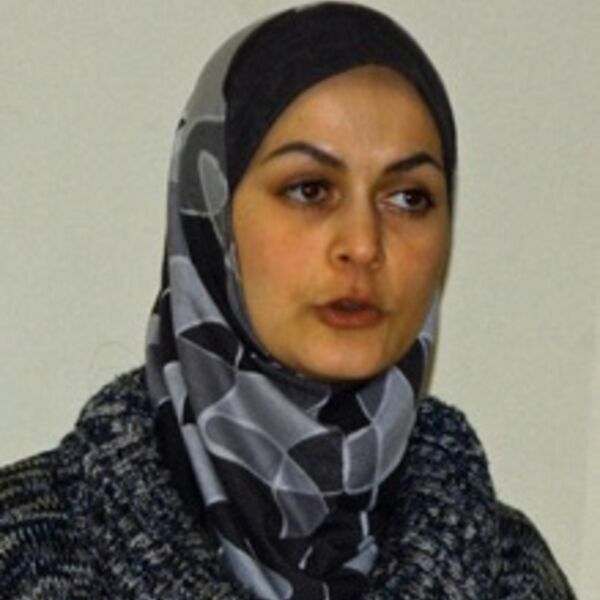 In this episode you’ll hear a conversation I held recently with Laila El-Haddad, a political analyst, author, and rights activist who is from a family deeply rooted in Gaza, Palestine, though she currently lives near Baltimore, Maryland. Laila is the author or co-author of three Gaza-themed books, including the famed "ethnographic" cookbook, The Gaza Kitchen: A Palestinian Culinary Journey. In this episode, Laila talks about how it was to be a Gaza Palestinian living outside Gaza during Operation Cast Lead, while knowing that her parents and many other loved ones were trapped inside the city. She and Helena discuss U.S. policy during and after Cast Lead, the best ways for international civil-society people to support Gaza today, and the new emergence of the Palestinian "Cultural Pride" movement. Speaker 1:0:01Today from Justwell podcast, I'm Helena carbon, the president of just world educational. We work to expand the discourse on vital issues of global peace and justice, especially in the long troubled Middle East. This is the seventh and final episode in a special mini series we're releasing as part of our cost lead plus 10 project, which started on December 27th and has been running for 22 days. This project marks the 10th anniversary of Israel's operation cast lead assault against Gaza, which ran during these same 22 days exactly 10 years ago. If you're on social media, we using the Hashtag Hash cost lead plus 10 to draw together all the activities. We're running on our twitter and facebook accounts to follow us on both platforms. We also have a great page on operation cast lead in the resource section of our website, www.justworldeducational.org. There you'll find links to all the episodes in this podcast, many series and many other useful materials, so do check out that resource page on our website. Speaker 1:1:20In this episode, you'll hear a conversation I held recently with Layla and her dad, a political analyst, author and rights activist who is from a family deeply rooted in Gaza, Palestine, though she currently lives near Baltimore, Maryland. I first met Layla when she and I were both doing news reporting from Gaza in the immediate aftermath of the Palestinians, 2006 parliamentary election, which was won fair and square by her mass and achievement that thereafter brought down upon them the loss of Israel and the United States. Over the years since we'd met my publishing company, just world books has published three of Layla l, her dad's books. The first Gaza mom was a compilation of the amazing blog posts. She wrote between 2004 and 2010 on her eponymous blog, guns a mom then came the Gaza kitchen, a Palestinian culinary journey, which she coauthored with my day, Schmidt and which came out in 2012. Speaker 1:2:31Finally, in 2015, I published an anthology of writings from an ongoing titled Gaza and silenced that Layla Co edited with the Gaza based literature teacher with Atul Arya, the Gaza kitchen. I should note was the very first in a series of cookbooks that have come out in recent years that have all presented Palestinian cuisine beautifully to the English speaking world. In September 2013, layla was the chief in Gaza guide to the now tragically deceased Antony Bourdain when he made his iconic visit to Gaza to explore that Palestinian regions quite distinctive food heritage, and in 2016, Layla and her co author Maggie Smith, joined the London based restauranteur and cookbook author Yotam Ottolenghi at a special program organized at the Metropolitan Museum of art in New York to present an honor the food heritage of Jerusalem and it's region. Layla truly is a pioneer of the Palestinian cultural pride movement, but back in 2008, she was living with her husband. Speaker 1:3:50He has seen and their two young children in Durham, North Carolina. When she heard the terrifying news of Israel's first big shock and awe assault on Gaza in late December of that year, her parents, both of them retired physicians in their apartment in hard hit central Gaza City. One reason layla and her family could not be in Gaza at that time was because her husband, a Palestinian, grew up in a refugee camp in Lebanon and is therefore forbidden by Israel from entering Gaza, an area that has been under Israeli military occupation continuously since 1967. So if Layla wants to conduct a normal family life with her husband and children, she has to do so elsewhere. The situation of Israeli enforced separation that Layla and her dad and her family suffer is one that's very familiar to Palestinians everywhere in Gaza itself. More than 70 percent of the population are refugees who since 1948 have been forcibly prevented by Israel from returning to their homes and loved ones inside the area that became Israel that year and the terrible conditions of life that Israel has imposed on the whole of Gaza is population. Speaker 1:5:18Ever since it forcibly occupied the Gaza Strip in 1967 means that a huge proportion of the people who grew up in Gaza have been unable to find work or a decent future there and over the decades have gone elsewhere to find stability. As a result, every single person in Gaza today has large numbers of close family members, daughters, sons, sisters, brothers, aunts who are outside the strip, and because of Israel's restrictions, they find it very hard, if not impossible to ever return there and does in nearly every part of the world, including here in the United States. There are also large numbers of Palestinians who have close family in Gaza and who every time Israel launches a new assault against the strip, experienced the pain of watching Israeli bombs and weapons tear apart the lives of their loved ones who are still there, but he'll have to do so from a distance. In an earlier episode in this mini series, we heard from Dr Naim name, who was as minister of health in December 2008 about some of the horrors that he witnessed that during operation cast lead today. We hear from later her dad what it was like as a Gaza Palestinian of many generations. To learn about that assault from the outside. Knowing that my own parents and many of her other close relations and friends were still in Gaza and exposed to the brunt of Israel bombs. I started by asking layla if she could recall how that felt. Speaker 2:7:05Yes, absolutely. And just to provide some context. This was at a time, uh, in, you know, December of 2008, January 2009 when social media was still pretty nascent. No, twitter has sort of just taken off and um, things weren't as information I should say, live news feeds from areas of conflict or whatever, um, was not as readily available as it would have been now. Meaning, like not everybody was equipped with a smartphone that could immediately, you know, um, film what was happening around them and upload it and put it on facebook or there wasn't even facebook live at that point. And the reason I mentioned this is because, um, people were that were in my situation, um, you know, we're struggling in the sense of trying to, you know, have access to information and figure out what was happening to left one, amplify that information to the world. Speaker 2:8:11And it wasn't as easy to do as it would have been now in 2019. So when I, you know, we began to hear that Gaza was being attacked. Of course it was painful and you feel impotent and at a loss. And um, of course, part of you have as many Palestinians and others can relate. You end up having survivor's guilt and um, he wants so badly to sort of be there with them, but at the same time you realize that you have a role to play. And I think this sort of universally applicable have role to play on the outside in terms of being able to get that information out there or educate people about what's happening. But it was an incredibly difficult. I'm not only because you never knew what was going to be happening to your parents. Thank God that we have skype at that time. Speaker 2:9:02Um, and the limited hours of electricity when the power was on because of course the Israeli army was a collectively punishing the Palestinian population of Gaza by often at that, especially at that time by turning off the electricity at certain times. And so we wouldn't have, they wouldn't have access to Wifi or Internet when they did, of course, they would immediately sort of make a plan to communicate via skype or I would call them on the phone if the phone lines were up and we would uh, communicate that way. And what I started to do was have them conveyed to me in small snippets of what was happening and I would then go on to twitter and elsewhere and try to kind of relay that information to the world. But it was a very trying experience, I think, you know, obviously it was more trying for those who were living through it there, but trying to relate what was happening to my children, trying to kind of grasp and figure out, you know, what it is that was going on because this was sort of the first major invasion on Gaza. Speaker 2:10:05Then two more we follow of course. So a lot of sort of new artillery was being used. A lot of new tactics. I'm trying to make sense of all of that was incredibly trying. And I think it's just sort of a microcosm example of, you know, to the longevity of what it's like to be on the outside looking in when you were one sort of on the inside looking out and how can you then, you know, maintain your role or your ability to relay that struggled to your children, to your offspring, to others around you instead of just becoming sort of complacent about it. So it must have been terrifying for your children. How old were they at the time? So at the time I had two children, my son use of was four years old and my daughter node actually turned one year old in the middle of the invasion. Speaker 2:10:57So she was on January first it was her birthday and I remember writing a blog post about that experience. I'm trying to organize a birthday party for a one year old at the same time that your own parents were under the lake. And it was just that thought process of, of I'm not even really, we didn't really organize a party, but just sort of commemorating that, remembering that she had turned one just as all of these that I remember listening to many of these children that had died on this day that she was born. Um, so just kind of those I'm striking contrasts. He'd always go into my mind a, could you share a couple of the conversations that you had with your dad at that time? Yeah. Um, I feel like I need to go back to my, um, um, some of the writings I did at the time and, you know, maybe I could read it. Speaker 2:11:55I had a small passage from one. Is that something you want me to do? Yeah, I would love to have you read it because it's very powerful. See if I can hang on. I'm just looking at my bookshelf quickly. So, uh, what I was doing at the time, his writing based on my conversations with my father, writing out these very poignant blog posts and I'm, which eventually some of them made it into the book Guzman. And one of them that I'm going to read for you is a bloodied in Gaza. It was based on a longer essay that I wrote for the Guardian at the time. This was a Durham, North Carolina, December 30th, 2008. There is a complete blackout in garden. Now. The streets are still as that. I'm speaking to my father Mussa as a retired physician who lives in Gaza City on skype from Durham, North Carolina, where I had been since mid 2007. Speaker 2:12:55The month Gaza's borders were hermetically sealed by Israel and the blockade of the occupied territory further enforced. He is out on his balcony. It's 2:00 AM. I can only see gray plumes of smoke slowly rising all over the city. Everywhere I look, he says as though there were some beautiful, comforting byproduct of some hideous malicious event. My father was walking out. When the initial strikes began, I saw the missile's falling and I prayed. The earth shook. The smoke rose, the ambulances screamed. He told me my mother was working. Her shift at the Red Crescent Society, when one of the police stations behind the clinic was leveled. Now three days later, they're trapped in their own home. My father takes a deep restorative side before continuing Barack. He's. He's going crazy. He's bombing everywhere and everything. No one is safe. Explosions are audible in the background based on distance and dollar over my laptop speakers, but linger like an echo in death valley. Speaker 2:13:58They evoke terrifying memories of my nights in Gaza. Only two years ago, nights that to this day haunts my four year old son who refuses to sleep on his own. Can you? Can you hear them? My father continues. Our house is shaking. We're shaking from the inside out. My mother comes to the phone. Hello? Hello, dear. She monitors. Her voice is trembling. I had to go to the bathroom, but. But I'm afraid to go alone and I wanted to go perform. We'll do before prayer, but. But I was scared. Remember the days when we would go to the bathroom together because we were too afraid to go alone. She laughed at the thought it seems in using to her. Now that she was scared to find her death in a place of release that she was now terrified at the same seemingly ridiculous scenario, it was really the fear of being alone. Speaker 2:14:41When you hear the news before it becomes news, you panic for clarity. You want someone to make sense of the situation, package it into comprehensible terms and locations. Just to be sure it's not you. This time it's, it's strange. My whole body is shaking. Why is that? Why is that? She rambles on. Continuous explosions, audible in the background. There they go again, one boom after another, 15 before that one or two, maybe 20 total so far. Counting and systemizing the assaults makes them easier to deal with, more technical, more remote. The reign of death continue to fall in Gaza and you the world watches and silently. Governments plotted. How shall we make the funder and clouds rain desk onto Gaza and it will all be made to see you in the end of the day as a response to something rockets broken, reconcilable, but Monday morning, five sisters from one family were killed. Speaker 2:15:36When Israeli war planes attacks a mosque next to their home for your old job, I had unwanted eight year old Dina on what? Twelve year old? Fourteen year old. Come on. What? A 17 year old to heavier underwater. The small shop down the street from my parents' home next to the king's mosque where many of the demand neighborhoods, affluent residents pray, opens for a little while. After prayer. My father goes and gets whatever he can while he can. They have one package of bread left, but insist there. Okay. Those with children are the ones who are two of these suffering. Ramadan's grandchildren will only sleep in her arms. Now they're awaiting their pants again, my son, use of times into the conversation unceremoniously popping his head into my laptop screen. So you don't. I like the for two cities to make. So you do. Are you okay? Hi Baby. When we see each other again, if we see each other again, I'll make it for you. He promises the very possibility seems to comfort him no matter how it's my daughter knows his birthday on January first. She will be one year old. I cannot help but think who was born in bloodied Gaza today. Wow. And that stuff is so powerful. I know, I forgot. I haven't read it in so long too. You know, that it's kind of going back. Yeah. Sometimes when you read something that you, yourself have written, when you read it, it, it like, it has so much more resonance. Speaker 2:17:05Thank you so much for doing that. Um, I think let's move on to the issue. I know this meant, but move on to the issue of US policy during and after college because this was the waning days of the George W dot Bush administration and it seemed to have been timed very much for that. You know, when there would be a lame duck administration here in Washington. So what do you recall from both President Bush and president elect Barack Obama during cost led that sticks with you? Well, I just remember that people had really pin their hopes on the fact that Obama was going to be sworn in soon as president. And we're completely, utterly disappointed when we found out that essentially, you know, Bush had told these Israelis, you know, you have this much time and Obama echoed those words until to do what you need to do. Speaker 2:18:11And Obama was basically an agreement instead of saying this needs to end immediately, it was like you have a free blank check, free rein to do whatever it is you want to do, no questions asked, no accountability for this many days. And, um, I mean, just that thought that, you know, the world's most powerful country and its president, new president and president elect knew what was going on. Um, the magnitude of what was happening. And again, this was something unprecedented. Um, you know, the sad reality is that it would be followed by two subsequent invasions, but this had never something on the scale. We had never witnessed this before. And Palestine that they knew and they said, you know, makes them complicit. And they said no, go right ahead and that they could have stopped it. And they didn't. And there was definitely at least one resolution in the Security Council, a ceasefire resolution. Speaker 2:19:10And I think maybe more than one where, you know, they vetoed it, forgotten about that even more appalling, I think. Um, but again, I think sometimes we foolishly pin our hopes on, you know, um, governments, when history has shown repeatedly that change comes from the outside in, not from the inside out, whether here in the United States or elsewhere. Right. And so I think this and the subsequent invasions really bolstered and boosted the bds movement, um, and I think really helped cement that in people's minds that if you didn't already know Oslo is dead, that if you didn't already know the two state solution and now more so in 2019 then at that point in 2008, um, that it's, this is all those sort of a smokescreen and an illusion. And the sooner that we recognize this, the better sort of, as a global community of concerned citizens. Speaker 2:20:11That's true. Um, and you, you said that obviously there were the two major Israeli assault after he passed. He was the first of his theories and very shocking and it, and it's in its own way, but in a sense also the, uh, the failure to hold Israel in any way accountable for cost lead did you gave them the permission to go ahead with the next one in 2012 and then with the truly devastating one in 2014, both of happened under President Obama. Absolutely. It's set the precedent. And that's why I keep saying, you know, by way of context, that this was the first one, that it was something, you know, um, on a scale that we haven't seen before. Um, and then the sad reality is it became sort of run of the mill, but it became one of a series of mowing the lawn. I'm in Gaza, right? Speaker 2:21:09Or mowing of the lungs in Gaza. And so yes, it did set this precedent and made it a completely acceptable to, um, you know, come down hard on Gaza without repercussions, without consequences. And, and, um, of course, this is where the complete cooperation and enthusiastic sums up of neighboring countries like Egypt for example. And um, and also as I recall at the time in back in 2008, 2009, um, president Mahmoud at Beth was kind of discretely or less discreet on the Israelis on, you know, so it was a major, major factor of Palestinian division involved in that. Yes, yes, that's true. That's, that's very much correct. And again, not much has changed on the ground when one thinks about it from that time onwards. It's a completely in the words of many a UN, I'm director of manmade catastrophe that has, you know, the seeds of which were sown and by men in which can be then undone by men and women and women. Right. I think the undoing is more, the women will have a role in that. But my point being that, you know, involved have an interest if that's an interest in crushing Gaza and make sure it remains subservient, you know, to use sort of the more sterile wiling which contained and that it never truly thrives or becomes productive. What kind of actions can concerned citizens, especially here in the United States, be taking that will help to ensure that the people of Gaza and the rest of Palestine can actually finally enjoy their. Right? Speaker 2:23:14That's an excellent question. And it can be very easy, I think to feel hopeless and um, see this as a larger than life struggle. Um, it's usually phrased in the way of conflicts, which I don't like that word, but um, and feel like there's not. Well, this has been going on for so long. There's nothing possibly that, you know, I can do about it. It's usually from the western perspective seen as um, well why can't I frequently hear why candies to people's just get along what? Of course, it's not about people getting along, but rather about it sort of basic injustices rights that need to be addressed. So I always say, you know, when I usually give a presentation in the end, I get asked this question, first of all, not to feel hopeless. Um, which is why I like to generally focus on the hope and the small sort of wins and things that people are doing on the ground, the positivity despite all of this because I feel like that reminds us that no matter what, you know, it's this struggle to survive for sure, but there is sort of beauty and created despite the impossible odds to completely erase one's identity and, um, and then you hopes an horizons have for productive future. Speaker 2:24:40Um, and so then we could, the minimum that we should ask ourselves is then what can we do here in the comfort of her own homes to be able to spread this message. And I always sort of give a little checklist, but the most basic one I start with is it start by educating yourself. And I give several resources. You know, um, you're a wonderful site. The just world, um, educational foundation. Mondo Weiss is another excellent resource. The electronic intifada, you know, try to follow maybe just one of these sites regularly and slowly begin to educate yourself about the truth of the Palestinian struggle. Because once you are then empowered with that knowledge and accuracy, you can begin to educate others by having small were small conversation starters. That's an excellent way. Um, maybe host dinners. You can, uh, sometimes I suggest to people, you know, hosted dinner based on either my book, the Gaza kitchen or if we're talking specifically about Gaza or there's another number of other Palestinian cookbooks and have a conversation maybe with people in your circles that aren't as aware of what's going on. Speaker 2:25:50And then, you know, then follow it up with, look at what kinds of local bds boycott, divestment, and sanctions initiatives are happening in your community. There's a lot of states now including Maryland continuously state legislators trying to pass anti bds laws that would punish businesses who engage in bds. Uh, see what's going on there. And you know, go to your legislature and on advocacy days, which they have annually and make your voices heard that this is not something that you accept, that it goes against the constitution. This is a thing. Now this is becoming mainstream or hearing about it more and more everyday of course on the national level. But also on the state level, um, you know, it's, it's, um, the tide is turning so the, you know, from the very small sort of don't feel overwhelmed if it's something that you don't have time for, just by educating ship all the way up to getting involved in various pds initiatives if you are able go and visit Palestine and Gaza is very difficult to visit, but at the very least, there's a lot of wonderful programs that you can get involved in that can help you, you know, go and see for yourself what's happening in the West Bank and elsewhere and Jerusalem. Speaker 2:27:00And that's really empowering as well. Uh, and then take those, you know, I witnessed, you know, testimonies back with you to your local groups, uh, you know, uh, and, and have presentations in your library or churches and mosques about what's going on in everyone. I always say, even though that we assume, you know, in my own community, the Muslim community, I assume how the very intimate knowledge of what's going on don't. And so we're constantly trying to educate those in the community because the more you know, then the more the more educated decisions you can make. And ultimately the reason this matters, I always have to go back to this is because we pay more from our taxes as American taxpayers to Israel than any other country. And so that's why it becomes then an onus on us, our responsibility to be able to take action, to do something to counteract the effect of those taxes to the Israeli military. Speaker 2:27:55Now it's that, you know, of course, under Obama that the bill was signed $4,000,000,000 a year in aide, military aide, specifically going to Israel. So one of the recent things that have been happening just this year is this hashtag tweaked your job with the job being the traditional Palestinian embroidery dress. And this is associated with, in particular congresswoman Rashida. I'm coming to the Congress from her district in Michigan. And suddenly there's this sort of explosion of Palestinian cultural pride, which I think is great because you know, the aeration that you talked about, the Eurasia of Palestinian identity and right and culture. And this idea that the Palestinians have never been a people deserving of rights or endowed with any culture, suddenly it's being challenged in a, in a way that I hadn't seen in this country in my 35 years here. So you're somebody who's worked a lot to promote Palestinian cultural heritage in particular the food heritage, but you know, also poetry and other forms. Speaker 2:29:13What kind of possibilities do you see in terms of. Well, in terms of, you know, Palestinian pride becoming a new thing and helping to bolster a Palestinian rights slash Palestinian solidarity movement. Right? I think, I mean, the two things can happen, you know, in parallel, um, I'm always sort of a little bit wary reducing the Palestinian struggle or tokenizing the Palestinian struggle by just saying it's a, it's just about, you know, our culture or something. But at the same time, that is an important component because of the very, you know, active efforts to try to invisibilize or erase or you value it, that culture. And that was one of the driving forces behind. One of the main reasons I was excited to write the Gaza cookson because I wanted to kind of codify that knowledge and presented to the world as a sort of different lens through which one can understand God's, uh, specifically in the Palestinian struggle at large. Speaker 2:30:28Um, so in that sense the culture becomes a tool, another tool at our disposable which we can present, you know, our struggle and our history and to, to the world. And I think that's important because so much of what we know or hear about Palestine, you know, is sort of universally whenever someone asks me when I'm traveling and I like to cover a lot what was happening us, I know that's the first thing that comes to them with. So that's um, and so that was that, that that's where the culture can play a role as you presented your union for sales to remind people that we are, you know, freedoms invites and it's frustrating that one has to make the case. But because overwhelmingly portrayed imaging to the content also in the case of Palestinian food heritage food culture, it's not just an attempt at a ratio. Speaker 2:31:30It also appropriation and which you, it hasn't happened so much in terms of, you know, the, like the handwork, the cadres, the embroidery and the beautiful dresses. I mean, there've been some little attempt to appropriate that by the Israelis, but in terms of the food culture, it's massive. That appropriation, I mean Israeli falafel and Israelis and Israeli restaurants opening everywhere and met celebrating. Yeah. So extremely frustrating. And there's always sort of a collective eye roll for Palestinians when this happens. I'm. Yes, I agree. And it's just a, you know, I'd like to think maybe naive view that the tide is turning a little bit and I'm, I'm very pleased to have been a, played a role in contributing something to the literature out there on, on Palestinian cuisine along. And there's two or three other excellent books of Palestinian cuisine right now, but I think you're the one that you and management both together. Speaker 2:32:38It was kind of the pioneer and okay, I'm the publisher, but I still think it's the best. It's so nice to hear that and I'm constantly sort of tickled. Um, I don't know if I just underestimate myself, but I'm constantly tickled when people come to me and say, you know, this book completely changed my perspective on the Palestinians and it just makes me so happy because I feel like, not to say my work here is done, but meaning, like sometimes just knowing that I was able to enlightened sort of one person as to the realities of what policy means endure makes me, it's very satisfying. Um, I always sort of relay the tail of the. When I first came to the US I was 18, I was in college and I went to visit my brother in New York and I remember seeing all these and shops and only to discover that they were Israeli. Speaker 2:33:33And I was completely and utterly shocked. Like what I, it was just this kind of, yeah, it was a complete my, my, my world sort of came crumbling down like what's going on? I don't understand. Like, and it was this sort of moment of fear where you grew up being told you don't exist as a people. And then to see that this was sort of coming full swing, not only do you not exist, but your foods are not your foods either. So, um, yeah, it's a sort of a battle on many fronts. Yeah. Well thank you so much for talking with us today. I'm here we are 10 years after Christ lead and as you said, things really haven't changed much in Gaza except possibly they've gotten worse. So thanks for everything that you do to help Americans and other people understand this. Thank you. Thank you for providing this forum for us to be able to bring these realities. You know, we hope for a better and more a positive hopefully. And more just 2019. Speaker 1:34:42Hi again. I hope you enjoyed that conversation I had with Layla and her dad and found it informative. This is the seventh and final episode in our podcast miniseries cast lead plus 10. You can find out a lot more about our cost lead plus 10 project and other projects at our website, www dot just world educational thought org there on the website. You'll also find a donate button where you can learn how to support all of our very timely projects going into the future. Thanks. Be sure to follow what we do and stay well for just world podcast. I'm Helena carbon here in Washington DC.